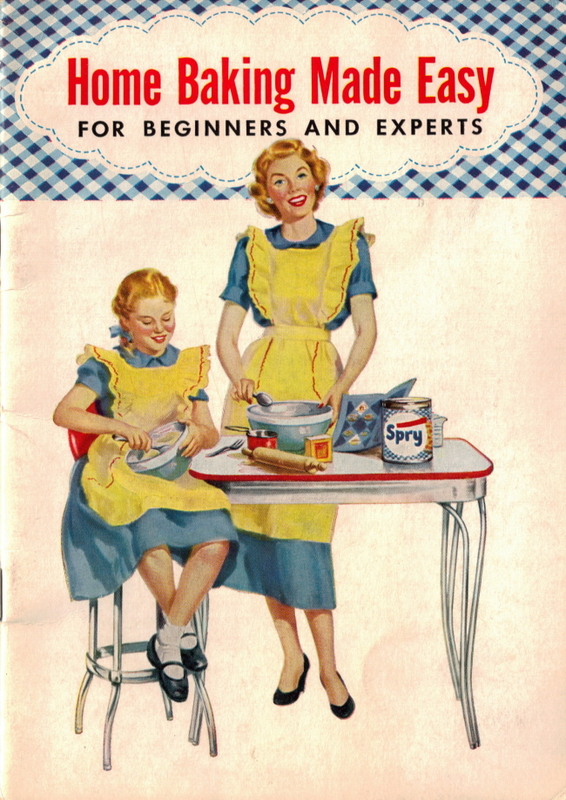 Here is page 10 of the vintage cookbook: Home Baking Made Easy that was published in 1953 by Lever Brothers Company. A masculine favorite—tangy with lemon juice and grated rind. Make the shell first, add the cooked filling when cool, top with meringue and bake. Makes filling for one 9″ pie shell. Mix cold water, salt and cornstarch. Combine hot water and sugar in top of double boiler and bring to boil over direct heat. Add cornstarch mixture and cook until thickened; place over hot water and cook until thick and smooth (15 minutes), stirring constantly. Stir a little of mixture into egg yolks, return to double boiler and cook a few minutes longer. Add lemon rind and juice and butter. Cool. Pour into baked pie shell. Top with meringue and bake as directed. For a high, light meringue, follow these 7 Success Secrets exactly. Bake in slow oven (325° F.) 25-30 min. 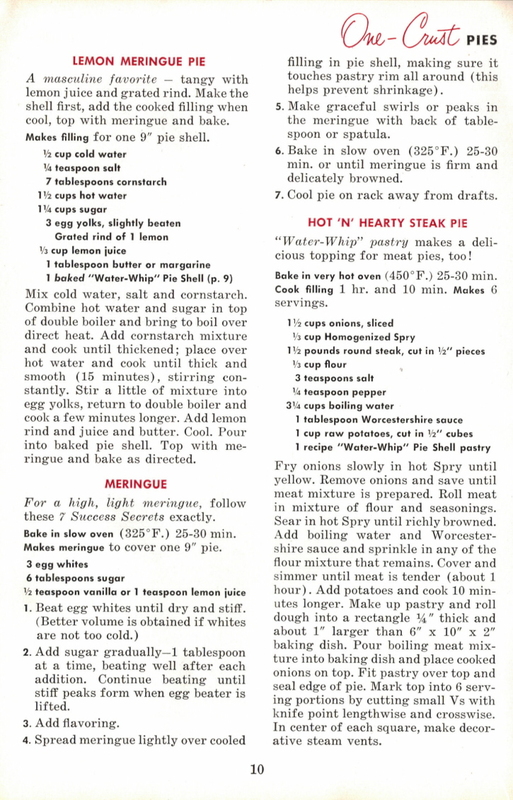 Makes meringue to cover one 9″ pie. Add sugar gradually—1 tablespoon at a time, beating well after each addition. Continue beating until stiff peaks form when egg beater is lifted. Spread meringue lightly over cooled filling in pie shell, making sure it touches pastry rim all around (this helps prevent shrinkage). Make graceful swirls or peaks in the meringue with back of tablespoon or spatula. Bake in slow oven (325° F.) 25-30 min. or until meringue is firm and delicately browned. Cool pie on rack away from drafts. 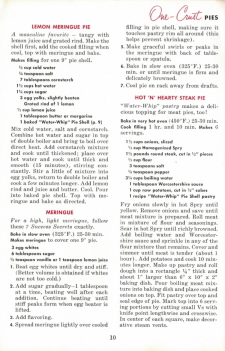 “Water-Whip” pastry makes a delicious topping for meat pies, too! Bake in very hot oven (450° F.) 25-30 min. Cook filling 1 hr. and 10 min. Makes 6 servings. Fry onions slowly in hot Spry until yellow. Remove onions and save until meat mixture is prepared. Roll meat in mixture of flour and seasonings. Sear in hot Spry until richly browned. Add boiling water and Worcestershire sauce and sprinkle in any of the flour mixture that remains. Cover and simmer until meat is tender (about 1 hour). Add potatoes and cook 10 minutes longer. Make up pastry and roll dough into a rectangle 1/4″ thick and about 1″ larger than 6″ x 10″ x 2″ baking dish. Pour boiling meat mixture into baking dish and place cooked onions on top. Fit pastry over top and seal edge of pie. Mark top into 6 serving portions by cutting small Vs with knife point lengthwise and crosswise. In center of each square, make decorative steam vents.